Back in the early noughties when I was discovering a world outside of Games Workshop (yes, it does exist! ), and Rackham had just blown my mind with its quirky designs and lashings of continental flair, I stumbled across Heresy Miniatures. The sculpts may not have been as sophisticated as those from our French cousins, but there was a visceral gutsiness to them which caught my eye. They were multi-part metal minis with lots of options and a good deal of room for conversion. The barbaric splendour of their half-ogre ‘mascot’ (if I dare call him that) grabbed me by the fruits the moment I saw him, and I keep coming back to him whenever Andy releases a new version!! 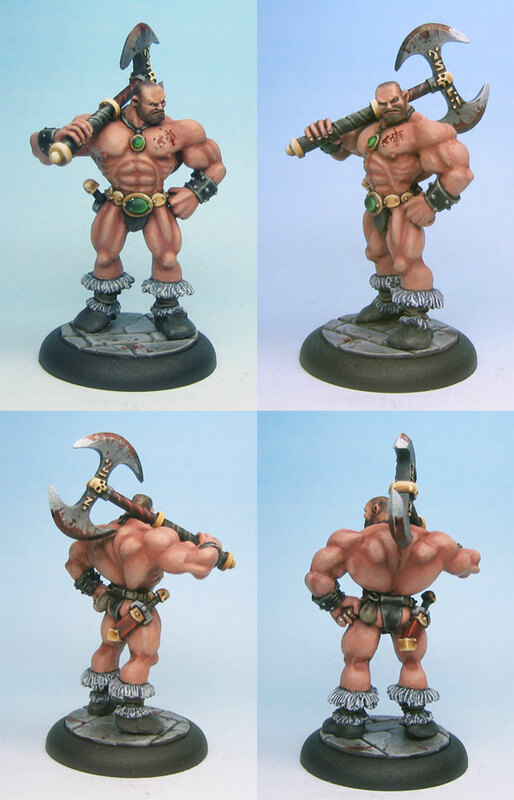 I love painting barbarians, and Boris is probably one of my favourites – up there with those elusive Howling Peak barbarians JAG sculpted for Ilyad (now long OOP and highly sought after*) and the Hasslefree Wolfs! In total I have painted 4 Borises and am currently painting my 5th! 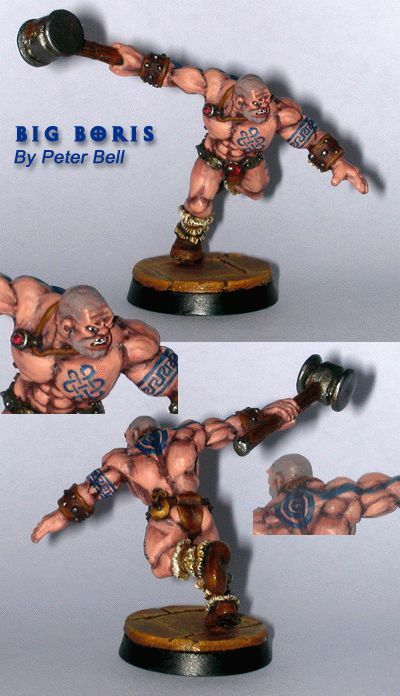 I painted my first Boris at the end of 2002 – this was their ‘Superdynamic’ Boris MkI, running full-tilt and swinging a huge mallet. At the time (10 years ago?! I can’t believe it!) this was a real boundary pushing mini for me – high contrast, lots of flesh to paint, warpaint and gemstones. These were the photos I took at the time (and subsequently uploaded to Cool Mini or Not). I still have this guy so may have to get new photos of him (but he really is that rough)… in fact I have an unpainted one too… might be time for a comparative paint-job! 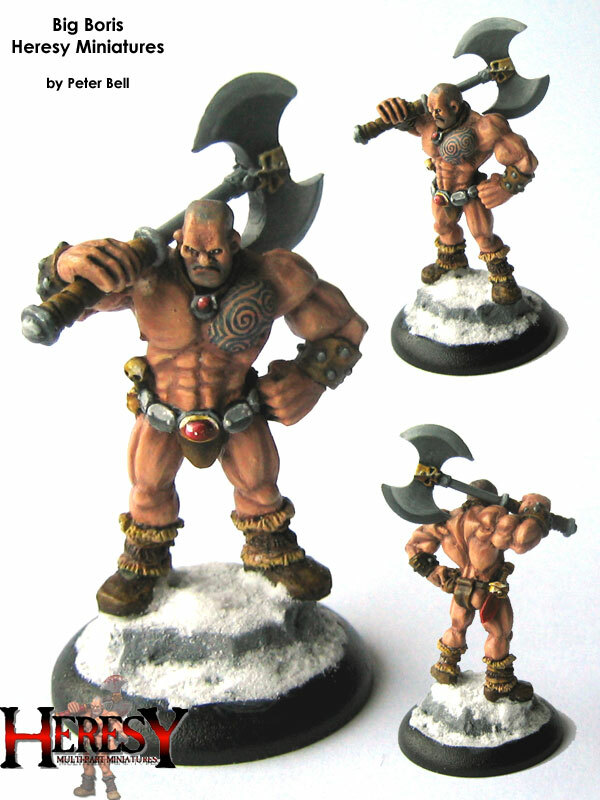 The second Boris I painted wasn’t long after the first, in May 2003. This was the standard Boris miniature in the now archetypal Boris pose – axe resting over his shoulder with his fist planted firmly on his hips, scowling as usual. This model is of note as it was part of a miniature exchange with ‘Jenova’. I sent this guy out to Denmark and received a wonderful Rackham Fianna (girlie barbarian) in return. This was also one of the first times I’d tried ‘NMM’ (or non metallic metals). Its a bit crude, but it was interesting enough to paint for me to keep trying. 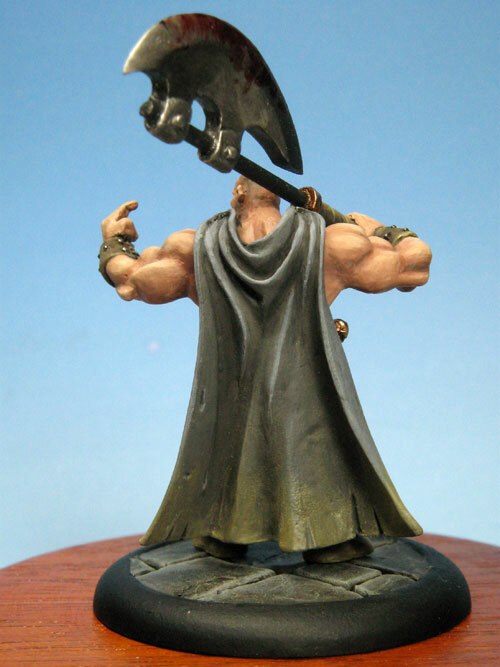 2005 saw Boris get a revamp – bigger and badder than the first rendition, I was pretty damn chuffed to receive a commission from Andy at Heresy (the big cahuna – sculptor/owner) to paint Boris for his collection and publicity shots. For added coolness I even had to send him high res images so that he could blow it up and get it printed on the huge vinyl banner he takes to trade shows… now THAT is pretty cool, seeing a 35mm model you’ve painted scaled up to several feet high…! Big enough axe for you? And this brings us to the present day. I can’t really believe its five years since I painted my last Big Boris, but I’m at it again… this time its the Heresy 10 year anniversary commemorative Boris – even bigger and significantly badder than even the last one! This one is being done for Andy at Heresy again, so I am really pushing myself (its got to be an improvement on the last one I did!) in terms of contrast and hopefully quality. This new Boris is good enough that I have got another one to do for my own cabinet, and I don’t think I’ll wait long to do it either… I have some ideas as to how I want to base him, and I will try a few things like tattoos on his skin which I might not risk on a ‘studio’ job, but I’ll make sure to post WIPs when I start. I HIGHLY recommend heading over to Heresy Miniatures and taking a look. If you are wanting a big, heavy, metal, brute of a barbarian, you really can’t go wrong! *I am lucky enough to own a number of them! Tee hee!